Thanks to Dr. Zainab Harb, Department of Pathology, Salmaniya Medical Complex (Kingdom of Bahrain) for contributing this case, Dr. Belinda Lategan, St. Boniface Hospital, Winnipeg, Manitoba (Canada), for writing the discussion, and Dr. Maria Tretiakova, University of Washington, for editorial review. To contribute a Case of the Week, first make sure that we are currently accepting cases, then follow the guidelines on our main Case of the Week page. Prime Day is Amazon's greatest deals event and it’s just for Prime members. Amazon is bringing you thousands of deals on everything you’re into. This year deals start at 9pm ET on July 10. New deals will be starting every five minutes, plus special offers across everything included with Prime - from music and video to reading and groceries. (1) It's a small change, but we wanted to let you know that when you click on a Case on one of the 4 Case of the Week pages (by clinical history, by diagnosis, by category/subspecialty with diagnosis, by category/subspecialty without diagnosis), the Case will now appear in a new window. We made this change to improve consistency across our website. (2) We have a couple new management articles that have been posted on our Management page this month. These articles, written by Vachette Pathology, are "Missed Appeals, MUE Denials And More In Vachette's Latest Audit Roundup" and "Salary Study Update: Michigan Pathologists in 2017". (3) New CME courses offered by ARUP Laboratories Institute for Learning were posted last month. And, we recently posted three new Roche LabLeaders webinars that are free to access and a new product announcement from Olympus. A 67 year old man, unknown to have any medical illness, presented with shortness of breath and productive cough. Radiological study showed a huge mediastinal mass with multiple enlarged pelvic and retroperitoneal lymph nodes. 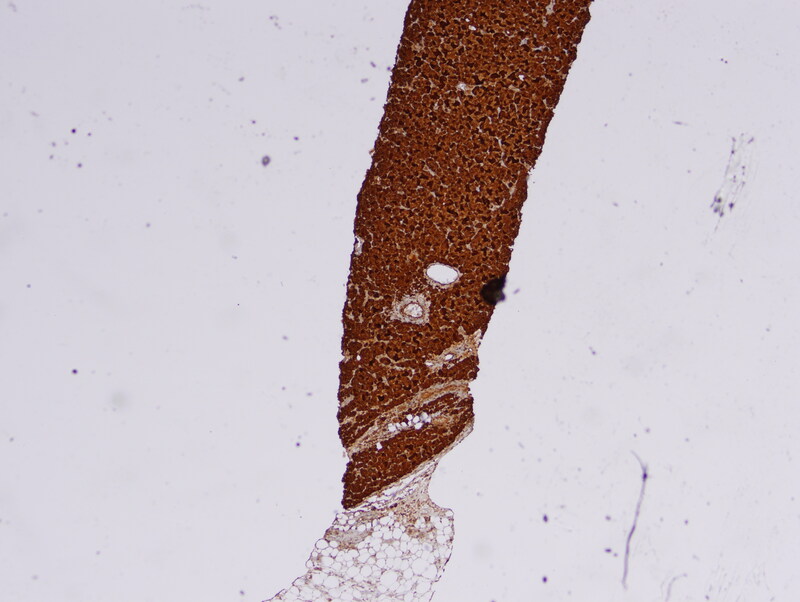 A needle core biopsy from the mediastinal mass was done. Mediastinal masses are uncommon in clinical and pathology practice. Excluding lymphomas, metastases to the mediastinum are more common than primary tumors, and typically are due to GI tract, lung, pancreas, pleura (mesothelioma), testis or thyroid primaries via the venous and lymphatic systems. The mediastinum can be divided into three anatomical compartments – anterior, middle and posterior, each with a characteristic set of differential diagnoses for mass lesions. 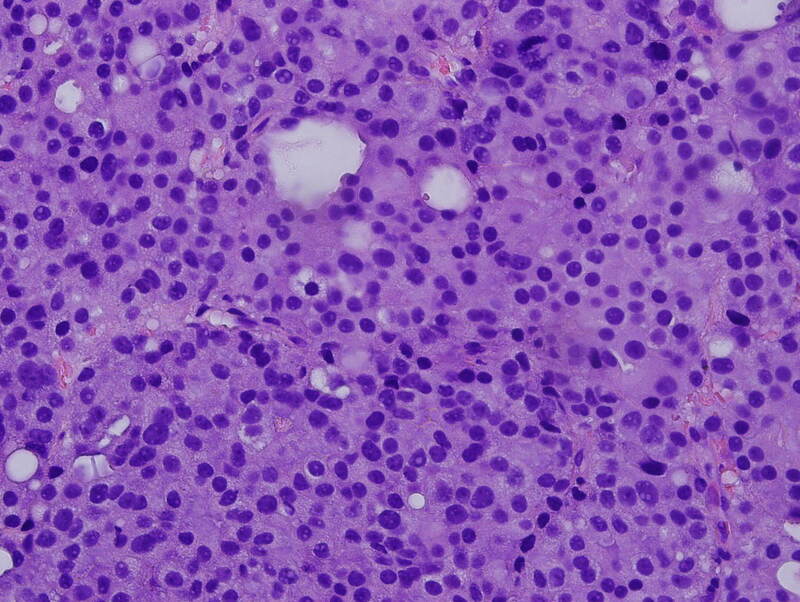 Thymoma is the most common primary tumor of the anterior mediastinum, followed by germ cell tumors and lymphoma. Lymphomas and developmental cysts are more common in the middle mediastinum, and neurogenic tumors and cysts are more common in the posterior mediastinum. Metastases can be seen in any compartment. Careful consideration of the clinical history, imaging characteristics and morphologic features with judicious use of ancillary studies is necessary for accurate diagnosis (Hum Pathol 2000;31:578, Chest 2005;128:2893). 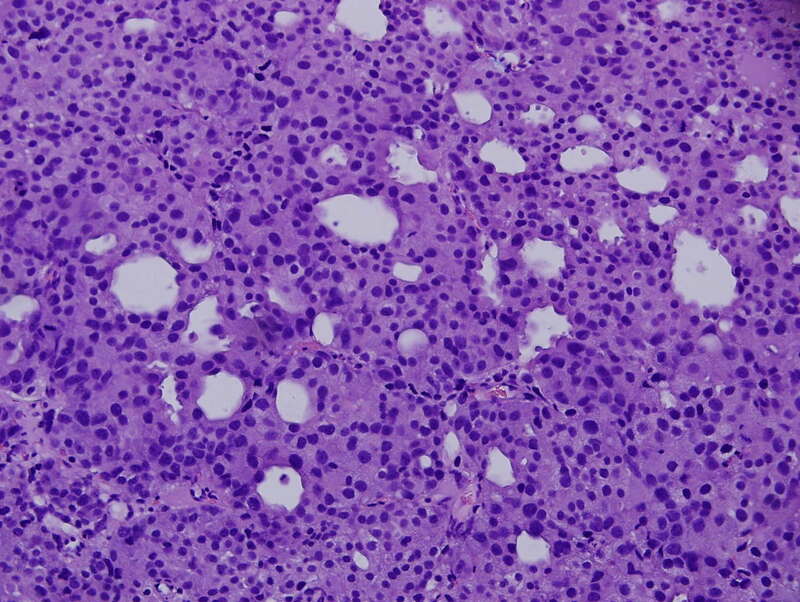 In this case, the needle core biopsy from the mediastinal mass shows malignant cells arranged in nests, cribriform structures and small acini with abundant eosinophilic cytoplasm and round nuclei with rare prominent nucleoli. Foci of necrosis and scattered mitotic figures are present. 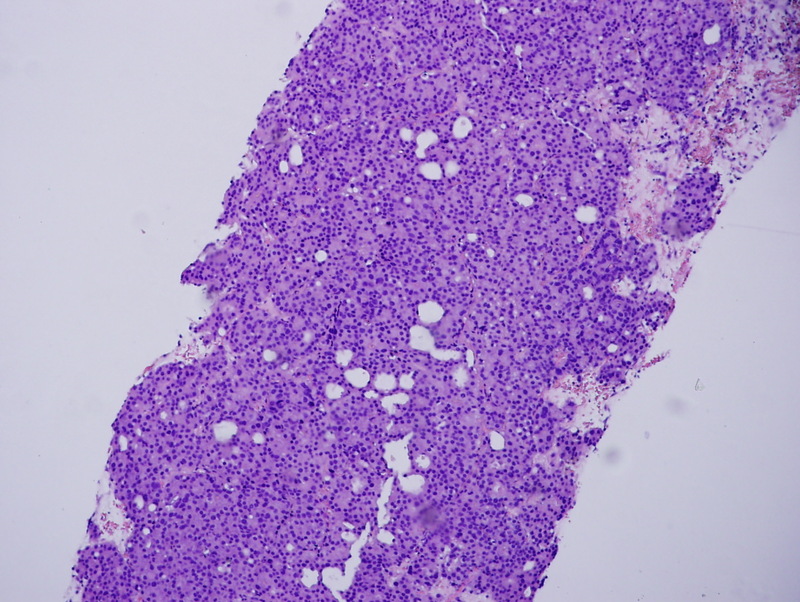 The differential diagnosis includes metastatic carcinoma from a lung primary or other site, germ cell tumor, neuroendocrine carcinoma and lymphoma. Immunohistochemistry for prostate specific antigen (PSA) shows diffuse strong positivity. The tumor cells are also positive for CK8/18 and negative for CK7, CK20, Chromogranin, CD45, PLAP, CD117, S100, and CD34. Taking into consideration the morphology and results of ancillary studies, a diagnosis of metastatic prostate carcinoma was made. The clinician subsequently obtained a serum prostate specific antigen (sPSA), with a result of >1000 ug/L, which supported the diagnosis. Prostate carcinoma is the second most common malignancy in men and the fifth leading cause of cancer death in men worldwide. Autopsy studies have demonstrated incidental prostatic adenocarcinoma in up to 30% of men over age of 50 when the gland is submitted in total, yet only 9% develop clinically signficant disease (WHO 2014). Metastases are detected in up to 65% of patients with clinically evident prostatic carcinoma (Hum Pathol 2000;31:578). Prostatic adenocarcinoma spreads through localized extension into adjacent structures and lymphovascular invasion to distant sites, most commonly involving lymph nodes, bone, liver, lung, pleura and adrenal glands. Lymph node metastases progress in a vertical stepwise fashion from the pelvis to retroperitoneal nodes. Unusual metastases may include atypical nodal metastases in an unexpected distribution, bulky lymph nodes, atypical morphology or enhancement pattern on radiological imaging. These non-typical metastases are usually encountered in advanced disease; and, as in this case, may be the presenting feature or the only sign of distant metastasis (AJR Am J Roentgenol 2012;199:367). A mediastinal presentation of prostate carcinoma is rare, except for aggressive castration resistant cancers, in which the mediastinum may be involved in up to 30% of cases (AJR Am J Roentgenol 2017 Jun 7:1-6 [Epub ahead of print]). Awareness of atypical manifestation of metastatic prostate carcinoma will result in earlier diagnosis and management. 3. Moch et. al. (editors), WHO classification of Tumours of the Urinary System and Male Genital Organs, 4th ed. 4. Vinjamoori et al., Atypical metastases from prostate cancer: 10 year experience at a single institution. (AJR Am J Roentgenol 2012;199:367). 5. Zhou M. and Magi-Galluzi C., Genitourinary Pathology. 2nd ed.